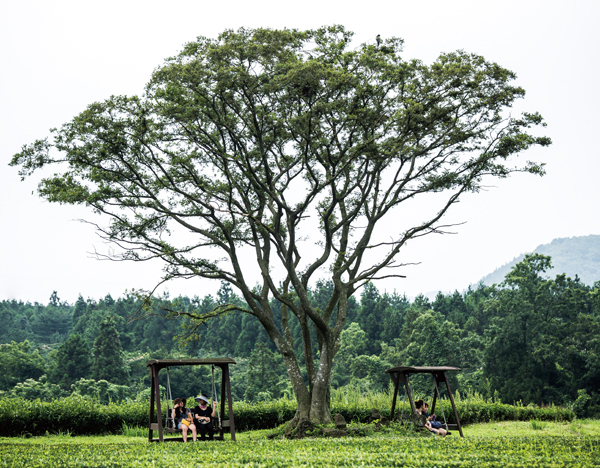 Despite its remote, rural location, visitors still flock to Daheeyeon Garden green tea plantation in Jocheon-eup. It is not just about tea trees either, as visitors can enjoy golf buggy rides, ziplining, sip some tea in a lava cave, or just enjoy the hopping little frogs in the ponds! “Ecotainment” is one of Daheeyeon’s key attractions and this entails ziplining along four routes across the property. You can travel across the green tea fields themselves, across the pond, through the cedar forest, or enjoy a seascape horizon. It doesn’t stop there – Daheeyeon also proudly proclaims it has the only cave café in Korea, the result of an unexpected find by the owner. There are thousands of meters of lava tunnels under Jeju’s green fields, and it was while the owner was planting tea trees at the foot of an oreum nearby that he stumbled upon the cave. The find was surely taking up some precious tea-planting space, so this bittersweet discovery led to some creative thinking typical of the nature-loving Jeju people. Remembering a cave café he had seen in Turkey on his travels, KIM decided to open the very first cave café in Korea. Of course, this café serves all the green tea products you would expect from a green tea farm including teas, lattes, bingsoo, cakes, breads and ice creams. The spacious café is also a superior MICE venue for conferences, concerts or artistic performances. There is even a restaurant next door, plus a souvenir shop, tea museum, and an exposition hall. Overall, Daheeyeon is much more than just a green tea farm, providing unique experiences well worth finding space in your schedule for. You can even jot down in your travel notebook that you visited one of Jeju’s awesome lava tubes and Korea’s one and only cave café.